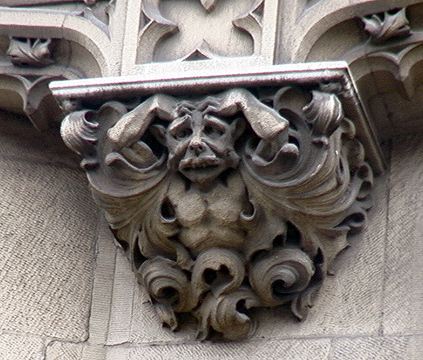 This chateau-like confection is a gargoyle-lover's delight. Occupying a prime site at the entrance to the 79th Street Central Park transverse road, this large mansion was erected in 1899 for Isaac and Mary Fletcher and was designed by C. P. H. Gilbert in the French Renaissance style. After Mr. Fletcher died in 1917, the house was acquired by Harry F. Sinclair and subsequently by Augustus van Horn Stuyvesant and his sister Ann Stuyvesant, descendants of Dutch Governor Peter Stuyvesant. In 1955, the property was acquired by the Ukranian Institute of America and it is frequently open to the public for exhibitions. "Here, the rural chateau form is compacted by the demands of an urban site, yet the house has a lively asymmetrical shape, and is complete with a moat-like areaway with front stairs suggestive of a draw bridge. The carved detail is outstanding: the winged monster ensconced on the chimney, the paired dolphins on the stone entrance railings, the rustic couples who flank the entrance, and the heads dripping from the second-floor window are but a few of the whimsical ornamental touches." 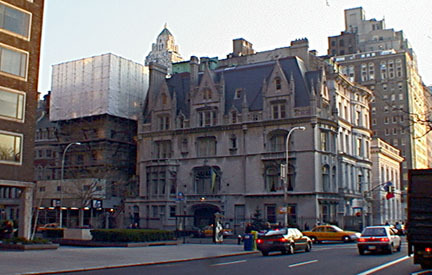 Another François I chateau-style mansion was designed by C. P. H. Gilbert for Felix Warburg at 1109 Fifth Avenue in 1909 and it is now the Jewish Museum (see The City Review article). 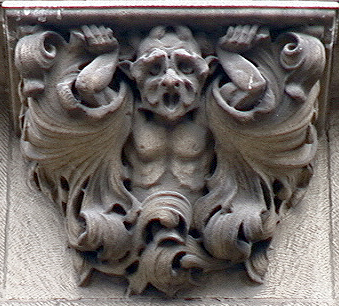 The architect also designed a major house in the same style for F. W. Woolworth of 5 and Dime fame on the site the apartment building that now stands at 990 Fifth Avenue. This building is across the street from the dark-brown apartment tower at 980 Fifth Avenue that replaced several townhouses including one that belonged to Isaac Brokaw and whose loss was one of the factors, along with the demolition of the old Pennyslvania Station, that led to the city's enactment of the Landmarks Preservation Commission. The Brokaw house was large but nowhere near as interesting or attractive as this mansion, which anchors an entire block stretching to Madison Avenue of townhouses, the only such block on Fifth Avenue on the Upper East Side. It also is the northern anchor of the extremely sumptuous block of mansions on the avenue between 79th and 78th Streets, a rare reminder of the glory days of when the avenue facing Central Park was known as "Millionaire's Row" and as lined with mansions. The lovely mansion at the south end of this block is the former James Duke mansion at 1 East 78th Street, which is now the New York University Institute of Fine Arts (see The City Review article). In 2002, the townhouse just to the east of the Ukranian Institute was completed renovated and rebuilt and the block took on more celebrity because one of the mid-block townhouses on the north side of 79th Street belongs to Mayor Bloomberg. In their fine book, "The A.I.A. Guide to New York City, Fourth Edition" (Three Rivers Press, 2000), Elliot Willensky and Norval White describe this as a "French Gothic palace," adding that "the classic comparison is the house of Jacques Coeur (ca. 1450) at Bourges." Not many people know that the grand French Renaisance-style chateau on the southeast corner of Fifth Avenue and 79th Street is actually open to the public. Built for a businessman and art collector named Isaac D. Fletcher in 1899, and later home to oil millionaire and scandal-ridden Harry F. Sinclair as well as Augustus Van Horn Stuyvesant (descendant of Peter Stuyvesant, the colonial director famous for his $24 deal with Manhattan's Native Americans), this mansion was purchased by the Ukranian Institute in 1955. The Institute hosts a multitude of events each year including art exhibitions, auctions, literary evenings, theatrical performances, lectures, concerts, forums and symposiums, and other social gatherings, both for members of Ukrainian associations and the public at large. Each of these events provides an opportunity to glimpse the splendors of a grand turn-of-the-century town house. Note the magnificent carved woodwork on the broad staircase and the many touches of elegance throughout the three floors that are generally open for view. 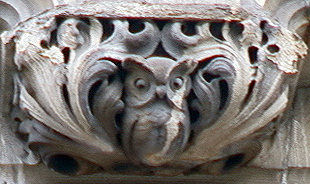 Nestled in the midst of "Museum Mile", which includes the Guggenheim Museum and the Frick Collection, and diagonally across from the Metropolitan Museum on the southeast corner of 79th Street and 5th Avenue, is one of the most magnificent and regal turn-of-the-century mansions in New York City. The history of the acquisition of the mansion by Mr. William Dzus, the founder of the Ukrainian Institute of America, dates back to 1898 when Isaac Fletcher, a banker and railroad investor, commissioned the architect C.P.H. Gilbert to build a house using William K. Vanderbilt's neo-Loire Valley chateau as its model, on the property, which was originally the Lenox farm. Mr. Fletcher was so pleased with his new home that he hired Jean Francois Raffaelli to paint a portrait of it; the painting, the mansion and the Fletcher's extensive art collection were all eventually bequeathed to the Metropolitan Museum of Art in 1917. Harry F. Sinclair, the founder of the Sinclair Oil Company, purchased the Fletcher Mansion in 1920 and sold it in 1930 to Augustus Van Horne Stuyvesant, Jr., a descendant of Peter Stuyvesant. A bachelor and recluse, Augustus Stuyvesant occupied the mansion with his unmarried sister until her death in 1938, then lived out the remaining years of his life until 1953 with just his butler and footman to serve him. William Dzus, inventor and owner of the Dzus Fastener Company in West Islip, Long Island, New York founded the Ukrainian Institute of America, Inc. in 1948, for the purpose of promoting Ukrainian art, culture, music, and literature. At that time, the Ukrainian Institute was located in the Parkwood mansion in West Islip, Long Island. The increasing membership and growth of the Institute prompted Mr. Dzus to search for a larger facility; he authorized the treasurer of the Dzus Fastener Company, Francis Clarke, to look for new, larger quarters in New York City. In 1955, the mansion was purchased by the Ukrainian Insitute of America corporation with with the charitable generosity and support of Mr. Dzus. In June of 1962 the mortgage was paid off and subsequently the Ukrainian Institute of America attained landmark status. 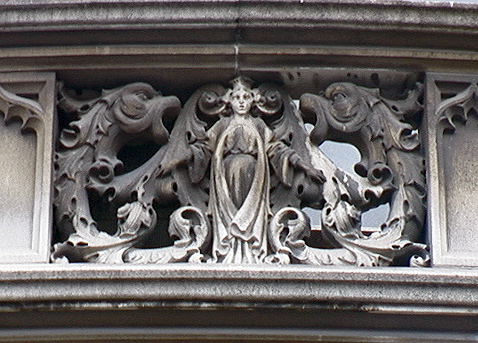 second-floor window are but a few of the whimsical ornamental touches." 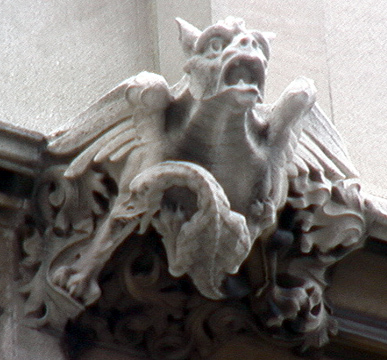 In his February 9, 2003 "Streetscapes" column in The New York Times, Christopher Gray wrote that "the lacy limestone pinnacles of the 1899 Fletcher mansion at 79th Street and Fifth Avenue are gleaming, the streaks of soot and dirt removed by a cleaning late last year by its owner, the Ukrainian Institute of America," adding that "This neo-French Gothic house is one of the touchstone works of the architect Charles P. H. Gilbert, who not only designed mansions for the leading families of New York but could also shoot at a gallop from underneath a horse." "The Gothic moldings, high mansard, giant entryway and forest of pinnacles," he continued, "make the building as much a fantasy as a work of architecture. Around the corner, the contemporaneous Converse house, designed by Gilbert at 3 East 78th Street, offers a nice little side-street riff on the same style. A third contemporaneous Gilbert mansion was that of Frank W. Woolworth at the northeast corner of 80th Street and Fifth Avenue, now demolished but similar to the Fletcher and Kleeberg houses....In 1902 Gilbert designed another imposing house, that of Joseph R. DeLamar at the northeast corner of 37th Street and Madison Avenue. Now the Polish Consulate, that structure lacks the lacy decoration of the high French Gothic structures, but its bloated size gives it the opulent quality of the earlier buildings....In collaboration with J. Armstrong Stenhouse, Gilbert designed a very reserved palazzo for the banker Otto Kahn. The building, now the Convent of the Sacred Heart, was designed in 1914 and completed in 1918 at 91st Street and Fifth Avenue."